The much-anticipated launch of the ‘Made in Ghana’ album is scheduled for April 20, 2019 at +233 Jazz Bar and Grill – and there is a beautiful album art cover to it. The cover has Okyeame Kwame standing in between two lofty talking drums, wielding drum sticks. The talking drum, is an archetypal Ghanaian musical instrument that represents language. Tuned to low and high tones, it is used to communicate messages in most Ghanaian linguistic settings. 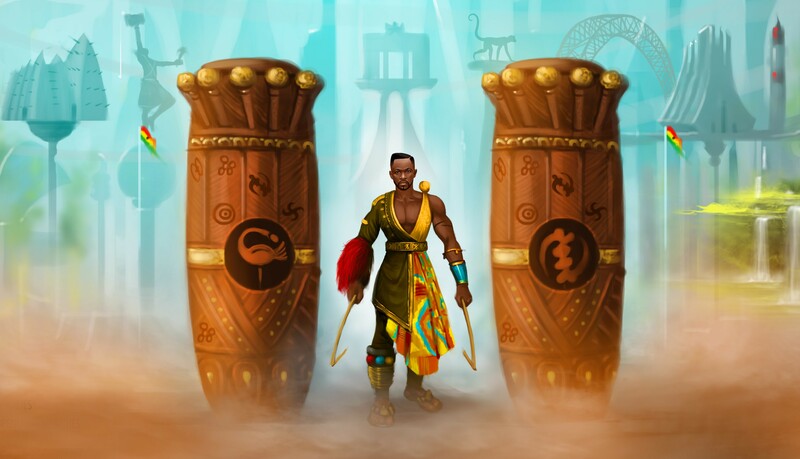 According to Okyeame Kwame, the huge fontomfrom drums in the ‘Made in Ghana’ album cover simply tell how loud he is drumming home the message of patronising Ghana in this project. The drums are bigger than him – which means the voice (message) is more important than the vessel (Okyeame). Also, the soul of Rhythmic African Poetry, a trade which Okyeame has perfected for the past two decades, these drums symbolise Okyeame’s adeptness in his field of endeavour (rap). The background art has a monkey which represents the monkey sanctuary. It also has the Independence Square, the Adomi Bridge, Okomfo Anokye, Mountain Afadjato – which all signify historical events and personalities of Ghana. The ‘Made in Ghana’ project is to highlight the virtues of all groups of people in Ghana across the various regions as it also encourages Ghanaians to be proud of their culture and heritage. The music videos will showcase some tourist sites in Ghana as Kwame’s contribution to marketing Ghana’s tourist sites. Already, two songs have been released from the album; the theme song ‘Made in Ghana’ which features KiDi and ‘Bra’ which features Wutah Afriyie. After the album launch, music lovers will have a taste of the other great songs on the album. The ‘Made in Ghana’ ambassador really deserves a national honour for championing this cause through music.